Carrots and sweet potatoes are the popular kids of the winter vegetable gang, but rutabagas are practically eating lunch alone in the bathroom: they look kind of weird and lumpy, like oversized purple radishes. But if you can get past their fashion sense, rutabagas are actually delicious and very nutritious – they’re particularly noteworthy for Vitamin C and potassium, plus a slightly lower amount of various B vitamins. 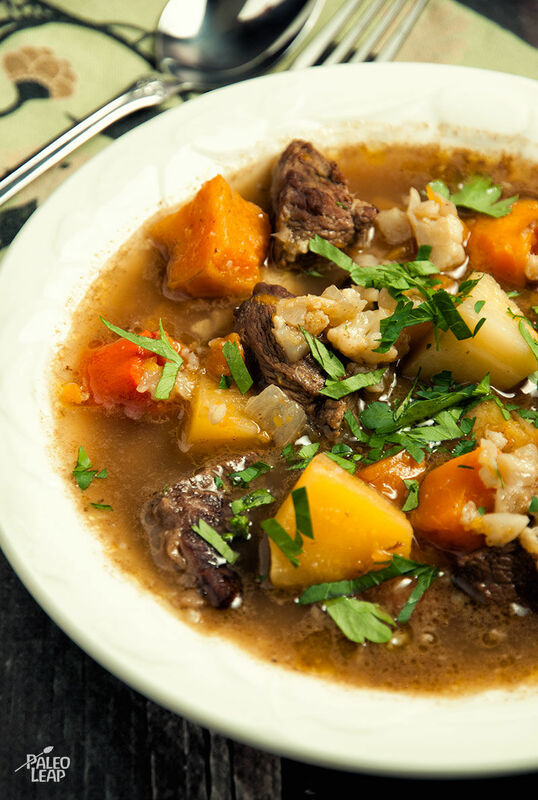 This soup combines rutabagas with the better-known winter vegetables and some tender bites of chuck roast to make one delicious soup. The riced cauliflower thickens the texture and gives you kind of a “vegetable and rice” soup effect but without the grains. If you’ve never riced cauliflower before, it’s very easy. Just grab the whole head and take a grater to it the same way you’d grate cheese or anything else. You’ll end up with a pile of cauliflower with the texture of rice, perfect for adding to soup (or anything else). This is a delicious soup for using up random bits and pieces of vegetables. Half a potato? Throw it in. Random cubes of butternut squash? Into the pot. Don’t quite have enough of one of the ingredients, but you’ve got a whole pile of another? No problem. Toss it all together, cook, and enjoy! SERVES: 4 PREP: 15 min. COOK: 1 h.
Brown the beef on each side, and set aside. Add the onion and garlic and cook until fragrant, about 5 minutes. Add about½ of the stock to deglaze the bottom of the pan. Add all the vegetables to the saucepan and cook, stirring frequently, until the vegetables are soft (about 10 minutes). 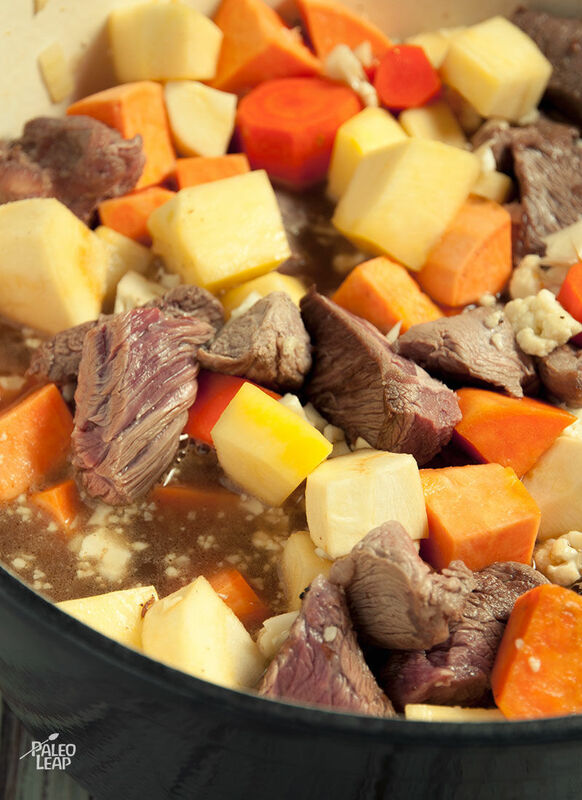 Return the beef to the saucepan, add the remaining stock, and cover. Let everything simmer over a medium-low heat for 40 to 45 minutes, or until the meat is cooked through. Adjust the seasoning, sprinkle with the fresh parsley, and serve.